Pokemon Go really has taken the world by storm! Of course I downloaded the app for my phone to see what it was all about and played it with the kids for a few days. It was fun to get outside and search for Pokemon to catch in the Pokeballs. I'm not really into video games and the kids are still quite young, so we didn't play much more than that, but Ethan kept talking about it and thought it was just really funny. 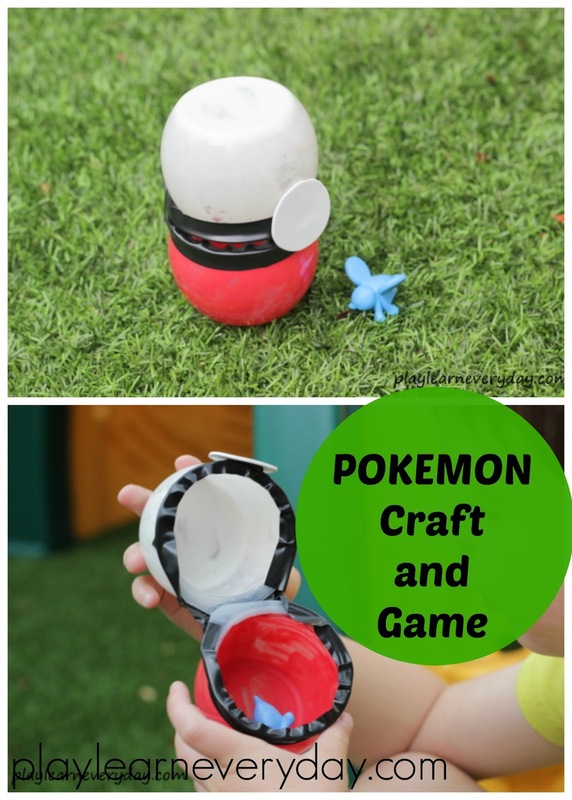 So I thought it would be fun to make some Pokeball crafts of our own and then play our own Pokemon inspired game of catching little creatures. The craft is super easy to make, which makes it perfect for young children to do mostly by themselves. We started by painting the inside of our yogurt pots. The kids each painted one yogurt pot red and one in white paint. Once the paint was dry we used the black electrical tape to stick the two pots together on one side as well as wrap all around the edges of both of the pots to look like a Pokeball. Finally we stuck on a circle cut out of a white foam sheet to the front of our Pokeball and it was finished and ready to play with! I hid little toy animals all around the back garden and sent the kids off with their Pokeballs to find as many as they could and catch them all and put them into their cute little crafts. They had so much fun catching them, then took turns hiding the toys and sending each other to find them. It was great for their counting as we always had to count to be sure that we had found them all, as well as their turn taking skills in playing the game. Oh I love this! We haven't played it yet but I've really been enjoying all the different crafts! This sounds like a great idea, I still have no idea what all the fuss is about with Pokemon Go to be honest.